This new 30.8 metre purse seiner ‘Violet’ raises the industry bar considerably in terms of equipment levels, capacity, capability and performance. Packing 1,280bhp (941kW), 60, 30 and 25kW radars, and a thumping great sonar which can detect pilchards up to 4,000 metres away. 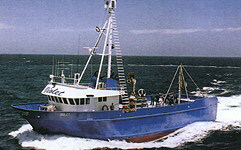 This vessel can expect to handle up to 200 tonnes of pilchards in a single night’s work. To tackle bigger catches ‘Violet’ is fitted with a V12 Caterpillar 3512B full authority electronic diesel main engine, I.M.O. – compliant rated at 1,2280bhp (941kW @1,800rpm continious A-rating. 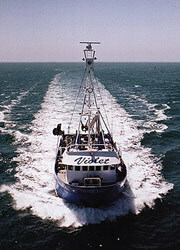 On sea trials ‘Violet’ achieved 10.5 knots at 1,800rpm. Taking pride of place in the centre of the engine room, the big Cat is flanked by smaller siblings, to port 3408 TA heat exchange mechanical engine, rated at 550hp (405kW) at 1,800rpm driving the ship’s hydraulics. Opposite is a Caterpillar 3306PA main generator rated at 180kVA continuos at 1,500rpm with Cat 3056 TA rated at 100kVA (1,500rpm) forward. As it leads to the stern the propeller shaft passes between six brine tanks set amidships and under the dual compartment blast freezer aft. 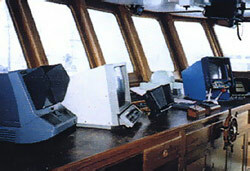 The extensive Simrad, Koden and Decca array of plotter, sounder, sonar, autopilot, GPS, and Decca Bridgemaster, installed by Quinn Marine of Port Adelaide, is fully interfaced via NMEA. 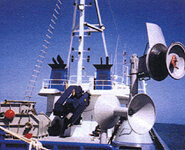 To compensate for the ship’s rocking motion, the Simrad SP270 sonar has full beam stabilisation. A “bird radar” was also installed with a 2.8 metre antenna radiator to detect flocks working over surface schools. Images are displayed on a 53cm multicoloured high resolution screen, this is the first installation of its kind in Australia,.. To handle the catch, this vessel if fitted with a four-tonne Palfinger hydraulic crane. 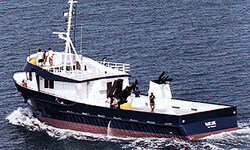 All hydraulics and deck equipment for ‘Violet’ was made, bar the crane, installed and connected by EBM Hydraulics. This involved the purse-seining winch to port of the crane, the net recovery winch and power block, the net stacker aft, anchor winch forward and the ship’s steering system. The ‘Violet’ has a 315 litre hot water tank for the accommodation/processing areas, freshwater filter and uses nearly 100 metres of insulated copper pipe in the process. The refrigeration system is a R507 refrigerant with DX control which will cool sea water to 0ºC and brine to -18ºC. They used coils in the brine tanks. The engine room has fan vents positioned up inside the superstructure, this innovation has produced a quieter and therefore safer, more comfortable working environment for the crew, who are also well looked after in terms of accommodation. There is plenty of space for sleeping, preparing and eating meals. 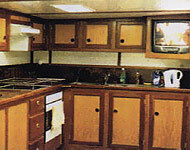 The galley/accommodation area is a sea of high quality timber, fitment, appliances, leather and lighting. 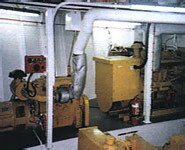 Below this is the engine room, also a spacious, brightly lit area. Generous walkways allow for safe, easy movement among the four Caterpillar power plants. The passageway aft from the engine room to the coolant and freezer equipment is similarly roomy and well lit. On the fully enclosed deck above, aft of the accommodation area, six white brine tank tops stand proud of a wide grey floor while at the stern is a full width blast freezer.